Today, I'm going to blog something about Qt5 on Windows Phone 8. Last week, Digia released a Technology Preview for the WinRT libraries . The WinRT (= Windows Runtime) is the base library for developing Windows 8 (also including WindowsRT on ARM) and Windows Phone 8 apps. So, I wanted to try it out for my Nokia Lumia 820. Before you can compile the sources, you have to install the Windows Phone SDK!!! Congratulation! You've compiled Qt5 Technology Preview for Windows Phone 8. You see how easy it is to build it. But you have to be aware, that not every part of the qtbase module is implemented. E.g. the Qt5Network module. But now, the hard part is starting: you want to compile a Qt application. I've started with compiling some offical qt examples. These are the examples that I managed to compile and test successfully. Navigate on the command line to the project directory. Run "<path to Qt5 build>\bin\qmake.exe -tp vc"
Open the *.vcxproj file with a text editor, an delete the "<CharacterSet>"-line. Go to Configuration Properties --> General --> set Platform Toolset to "v110_wp80". Confirm with Apply. Go to Configuration Properties --> C/C++ --> Precompiled Headers --> set Precompiled Header to "Not Using Precompiled Headers". Confirm with Apply and OK. Copy the needed Qt libraries to the project folder. For the examples above, you need Qt5Cored.dll, Qt5Guid.dll, Qt5Widgets.dll, d3dcompiler_qtd.dll from <Path to Qt5 Folder>\bin\ to the <Path to Project>\. Copy <Path to Qt5 Folder>\lib\fonts folder to <Path to Project>\. In Visual Studio, right-click on the project --> Add --> Existing Item and add the files from 6-8. Then mark the added files, right-click on it --> Properties --> set Content to "Yes". Now you're ready to build and deploy the application to your Windows Phone device. QML modules does not work at all. The port isn't in the same state like the Android and iOS technology preview during the Qt5.1 release, but it's a good opportunity to get more focus and effort in porting for WinRT. If they get a full port for WinRT, Qt will be a great framework for developers: they can targeting every mobile and desktop platform that matters, with one code base! <PATH TO SOURCES>/gnuwin32I hope that this will fix the compiling process!!! 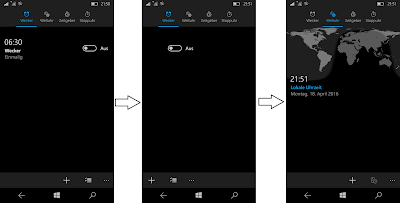 The goal for today: create a QML app for Windows 10 Mobile, with a native look-and-feel! The tools For the implementation, I'm using Qt 5.6(.0). Why? There are two main reasions. The first reason is a new QML extension called "Qt Labs Controls" (see chapter "Further notes"), which makes it very easy to write re-usable UI controls with QML. In the age of Qt4, there was an experimental support for easily using OpenCL together with Qt: QtOpenCL. These days, you normally using Qt5 for your projects and unfortunately, QtOpenCL was not supported with Qt5. 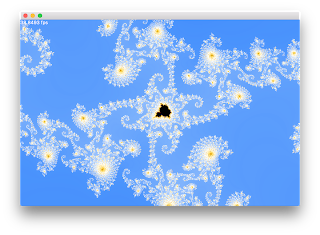 I'm happy to annouce that you can now use the original QtOpenCL module together with Qt5. The changes have been quite easy, I just had to transfer it to a Qt5 module from *.pro-files point of view. QtOpenCL internally consists of two sepereate modules: QtOpenCL and QtOpenCLGL. The first is for general OpenCL usage, the second one can be used for mixing OpenCL and OpenGL. You then can use the QtOpenCL headers by #include <QtOpenCL/...>. 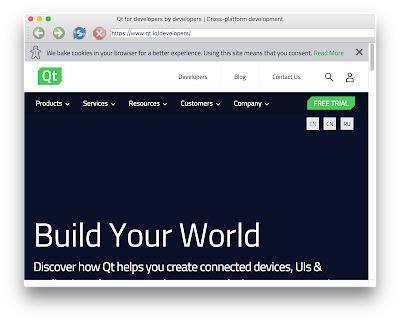 Updates for the QtWebKit module were dropped by the Qt Company after switching to the Blink-/Chrome-based QtWebEngine module. After years of development, there is still a lack of features that where available in the original QtWebKit module. Because of different reasons, some guys started to update the QtWebKit module with fresh code from the WebKit repositories. What you don't expect: WebKit is really alive and has implemented a bunch of new web features. Last week, the Technical Preview 5 was released . It should be compatible with any recent Qt5 version, in the following chapters you will see how to build it from source or how to use the pre-built binaries for Qt5.8. The release page of QtWebKit TP5 contains the source code package for building the module by yourself. Download it .